Commercial drain maintenance services in Rainham, Kent by the specialist team at JLH Drains including no dig repairs, CCTV surveys and pollution control. 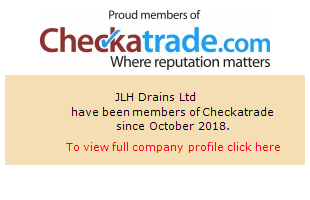 If you need a drainage problem fixed fast and professionally, JLH Drains are the specialist company of choice across Rainham, Kent. Dedicated to exceptional customer service and finding the most cost effective and long lasting solution to any problems with pipes, drains, blocked toilets and tree root damage, you can trust in our 100% success rate every time. Everyone wants to avoid pipe excavations if they can help it, but make sure you get any drain re-lining carried out by experts like our team at JLH. Poorly carried out re-lining can cause blockages and at worst won’t even fix the initial problem. Using extensive experience, well trained professional staff and carrying out a full survey of the re-lining repair with CCTV afterwards means we can guarantee customers across Rainham, Kent of an exceptional result. Drain CCTV surveys has become such an essential and cost effective tool in diagnosing and finding faults with drainage/sewer pipework in the Rainham, Kent area. Before CCTV it was common practice to have to remove floorboards or dig-up concrete and excavate vast quantities of earth to find damaged pipework involving unnecessary man power and time all at a cost to the customer. Our miniature cameras travel through your pipework enabling the quick diagnosis of the problem. Many insurance companies will require a CCTV Drain Survey before paying out and we can provide you with a copy of the video footage on request. Blocked drains, toilets or sinks are a big problem in the home or in business, besides putting facilities out of action they can quickly develop into unpleasant health risks. Our service, provided across the Rainham, Kent region, can deal with any problem quickly and professionally helping you maintain a sanitary environment; the service can include regular drainage maintenance works to ensure your pipeworks are functioning perfectly. Providing expert drain repairs is all about investment in the best technology and training to offer your customer the widest range of services. At JLH Drains we specialise in innovative approaches such as CCTV inspections, no-excavation epoxy cracked pipe repairs and dye tracing as well as traditional drain relining, remote removal of tap roots and high pressure water cleaning. We guarantee the most cost effective solution every time for clients across Rainham, Kent.